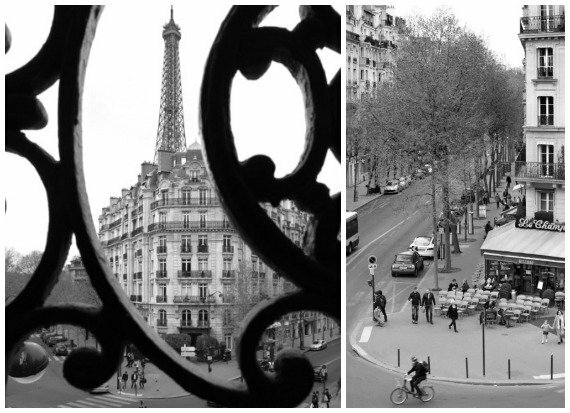 Have you ever dreamed of living in Paris? Waking up each morning and stepping out onto the balcony to see the soft colors of morning across the rooftops as the City of Light wakes up? Not having to feel rushed to see and experience everything as the days of a holiday–which never seem to be enough–pass by too quickly? Having the time to try the baguettes at all your local boulangeries until you find the one that is absolute perfection for you? Strolling leisurely along the Seine or popping in and out of boutiques without a hurry. Falling in love with a garden and watching the seasons change. These are the moments where Paris really captures your heart and you can savor them again and again. If you are considering spending more time in Paris, then we know just the place for you. How about a gorgeous and beautifully decorated two bedroom apartment with a picture perfect Eiffel Tower view? We know just the one that is available for rentals of 3 months or longer. Rentals starting September 1, 2014 for minimum 3 months: €3,945 per month plus utilities. Rentals starting January 1, 2015 for minimum 3 months: €4,595 per month plus utilities. Utilities are very reasonable, less than €120 per month including heating, electricity, internet and TV. Go ahead … dreams really do come true! A large antique chest of drawers and mirror reflect the period of this beautiful apartment and contrast with the modern coffee table and accessories. 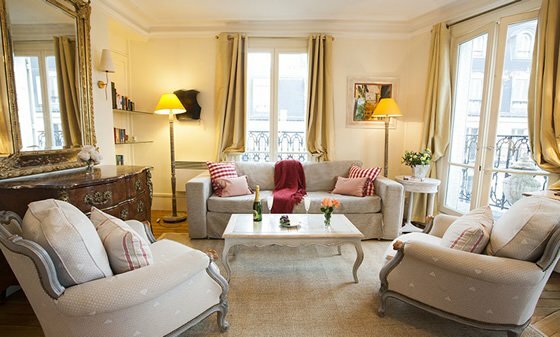 Sink into the sofa and armchairs and enjoy peaceful moments of daily life right in the heart of Paris. The apartment is on the fifth floor (sixth floor American and with elevator) and is bathed in sunshine throughout the day. 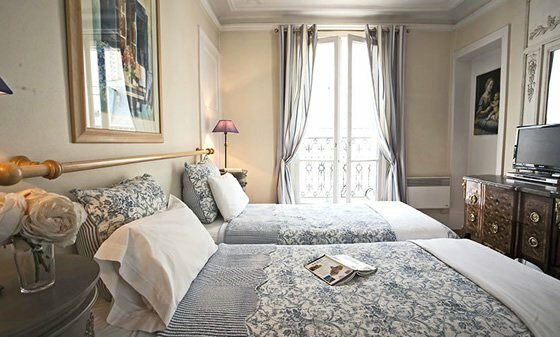 It is elegantly furnished and newly redecorated, offering our guests a truly memorable stay in the City of Light. Imagine doing your daily shopping at the little shops in the neighborhood or strolling down rue Cler. There are also several wonderful open-air markets just a short walk away! You’ll love cooking at home and enjoying all the French delicacies during your time in Paris. 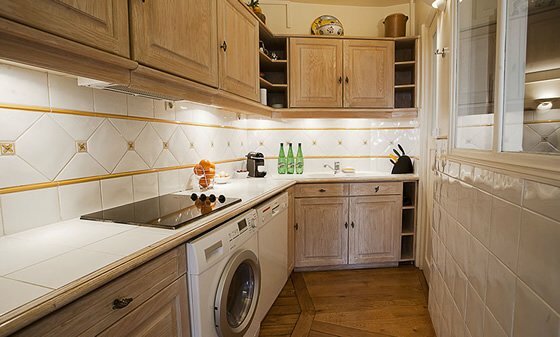 The apartment rental kitchen is large by Parisians standards, with double sinks, microwave-convection oven combination, large refrigerator with freezer, four-burner cook top, toaster, coffee pot, electric teapot, and a Nespresso maker, for real style. The combination washer-dryer is top-of-the-line by Miele, as is the Leifheit refrigerator. The Paris apartment’s master bedroom features a queen bed, en suite bathroom and balcony. Step onto the balcony and enjoy a south facing view of the top of the Invalides dome, where Napoleon is buried and home to a fascinating military museum. 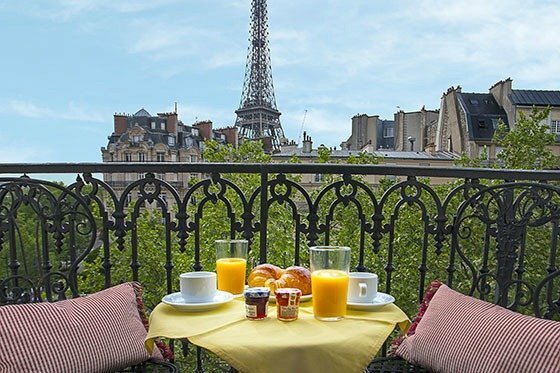 Enjoy the expansive views of blue sky and Parisian rooftops; you know instantly that you are in Paris. An important note: all of the windows are state-of-the-art double glazed, the same as used in luxury hotels. The apartment is located in the middle of this bustling city, but is extremely quiet for a good night’s sleep. Continue down the hallway to the second bedroom of our Paris apartment rental, on your left. This is a charming room, decorated in French Provençal-style, with elegant blue Toile de Jouy fabric bedspreads on twin beds. Built-in closets mean good storage along with bookshelves and a dresser. You’ll also find a flat-screen TV with cable channels plus a dual-standard DVD player for your entertainment. 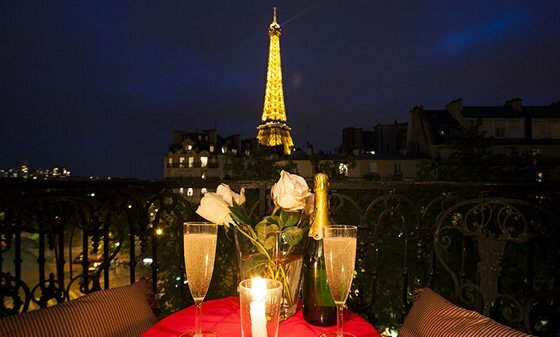 We think the bistro table on the balcony of our apartment rental is one of the most romantic and dramatic tables from which to dine in Paris, as you can view the Eiffel Tower and its magic show of lights every hour, listening to your favorite music on the stereo. 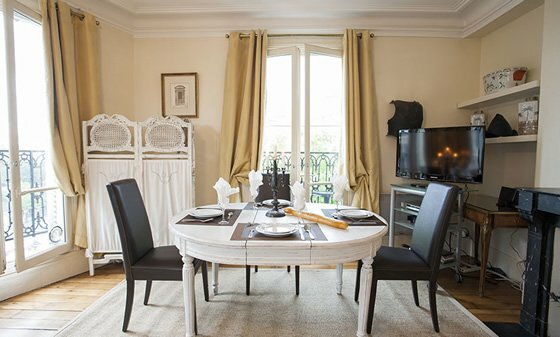 The magic of Paris is all yours in this beautiful and welcoming apartment rental in the 7th arrondissement! NEXT: Say Au Revoir to Jet Lag! Posted on Monday, July 21st, 2014 at 5:07 pm in Apartment Rentals. You can follow any responses to this entry through the RSS 2.0 feed. You can leave a response, or trackback from your own site. 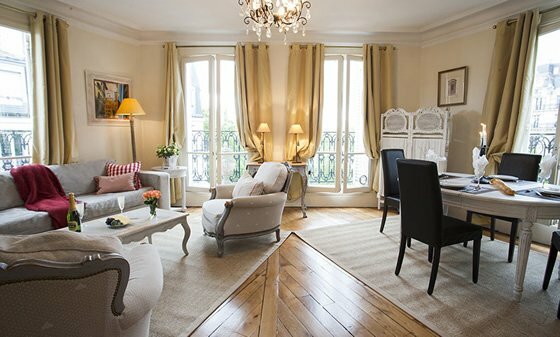 Finding Your Dream Apartment in Paris – Margaux and the Seven Year Itch Live Like a Local in the Gamay, a Long-Term Rental in Paris Author Jane Paech on Living the Parisian Dream Introducing the Charming Cassis Vacation Rental! Does this apt have a bathtub? This little-included fact is very important to some renters! Please send further information on rental (long term) of this apartment…Can the apartment be rented for a little less than 6 months, and what are the dates available? 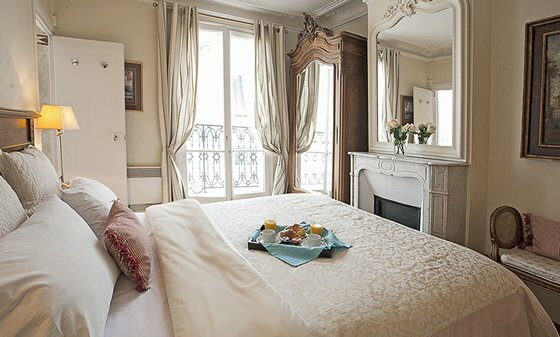 C est tres jolie cette apartment,combien coute?Est ce que vous aviez en saint germain des pres? Hello, I know you have advertised the apartment for six months. If it is not rented long term, I am interested in a two week rental next summer. Please let me know if it is possible. Love the idea of spending a few months in Paris. 6 months a little to long, but 2 or 3 months would be good. If you have any additional information about that type of an arrangement that would be great. We were very pleased with our accommodations thru Paris Perfect a few years ago. Bonjour, I am interested in the apt for 6 month lease and would like to view it when I am in Paris on Sept 26 if possible please? Otherwise when I return early October. Please advise a suitable viewing date, I have rented from you in the past. We are looking for an apartment rental in Paris from March 1,2015 to April 30, 2015, and our friends who rented with you gave us this website. The apartment you are featuring above looks beautiful, and we’re interested in knowing what else you have in the way of two-bedroom, two bathroom(two toilets) apartment in an interesting neighborhood in Paris. We are a retired English professor and a physician who have been in Paris dozens of times and love it! I am interested, but would only want a one bedroom. Do you have any available? What would a 4-6month lease be, say November-May1st? Hi We are an Australian couple in our 60’s and am interested in your 6 month lease. Could you please clarify a few things for us? What months of the year is the property available for rent? Television is mentioned. What services are available? Also is cleaning included during the stay and if so at what cost? Is there an additional charge for end of lease cleaning? Are there any other charges or taxes that we would have to pay?